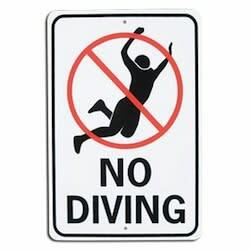 Diving has long been the scourge of the world's game -- a festering boil cursed by fans and mocked by all. But now the distrust that its prevalence has ingrained in the game has caused a dying man one final injustice. According to the Croatian Times and Eurosport, a 32-year-old Croatian defender named Goran Tunjic suffered a heart attack in the 35th minute of a county-level league match and collapsed on the pitch. Thinking the player was merely taking a dive to draw a foul, the referee showed him a yellow card before realizing that something was seriously wrong and called for medical attention. Tunjic was rushed to a local hospital but could not be saved. He reportedly had no previous health problems. "Doctors tried to help him but there was nothing they could do. It's a shame that a relatively young man's death during a game is being reported because it was mistaken as an attempt to cheat, but maybe now a few actual divers will rethink the practice. Or not. UPDATE: Apparently a Croatian site decided to look a bit further into this story and contacted Tunjic's club. They say that Tunjic was NOT shown a yellow card when he collapsed, which did happen in the 35th minute of the game, but he was playing back in defense, away from the ball. This story has spread pretty much everywhere over the last couple of days, but the club maintains that it is "pure fabrication." Thanks to Sebastian for bringing this to our attention.